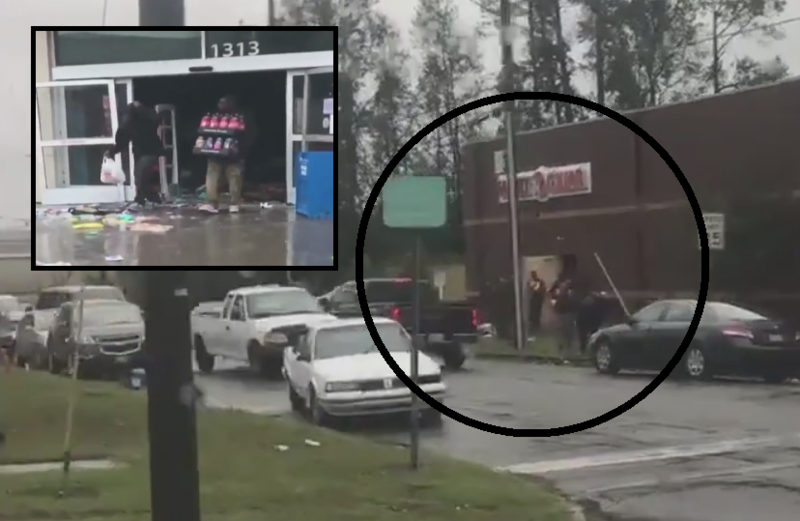 As always, the aftermath of a hurricane passing through a US state brings out the worst in people and looting could be witnessed at multiple sites. The passage of hurricane Florence, now downgraded to a tropical storm, was no different. We reported the first arrests yesterday and today more video is being uploaded to social media sites showing people taking ‘criminal’ advantage of the chaos that comes with the aftermath of a natural disaster. Related coverage: <a href=" http://thegoldwater.com/news/37109-Hurricane-Florence-Looting-Starts-As-Twitter-Feasts-Racist-Carolina-States-Get-Hit-Video"> Hurricane Florence – Looting Starts As Twitter Feasts ‘Racist’ Carolina States Get Hit (Video)</a>. “This curfew went into effect at 5 pm and will remain in effect until 6 am. The citywide curfew will run from 10 pm until 6 am." Meanwhile, the National Hurricane Center expects “catastrophic flooding” to continue in certain parts of the Carolinas. So far, at least 11 people lost their lives in the passing of hurricane Florence. Businesses risk robberies, looting, lawsuits, arson and employee assaults being there. An the very people they risk everything for &^%#& them over. When this Dollar General location closes due to the Looting and damages in the coming DAYS . This same group of Thugs will be screaming RACISM. Then some YA-Hoo! Community Activist will start preaching, and there will be the usual fly-in Reverend(s) seeking to grab a bunch of media attention for donations. The Race Card will be used to demand $$$$$ and collect votes for some Liberal campaign cause and the power brokers will be happy. But the losers will be the community, as they will still be out of a local community store. At least the twitterers hoping that the ‘white supremacists’ died will be glad to see one group survived….